A new medical study is looking for volunteers in Kern County to improve the treatment of Valley Fever. "We have one of the highest incidents of this disease in the United States, and it's a substantial problem in the county and the only other county that has as many cases as we do it Tuscon," said Dr. Royce Johnson, the medical director of the Valley Fever Institute at Kern Medical. Valley Fever cases are not as common in January, but there is always a risk. Dr. Johnson says the Valley Fever Institute needs the community's help to be successful. The research found will be shared with the National Institute of Health to work on improving treatments and get closer to finding a cure. For those interested in the study they must meet the eligibility requirements and enroll themselves. To be eligible you much be 14 years or older, have been diagnosed with pneumonia within the last 14 days or have been diagnosed with pneumonia and Valley Fever in the last 14 days. The study can last up to 24 months, and there are a series of evaluations within the first month. 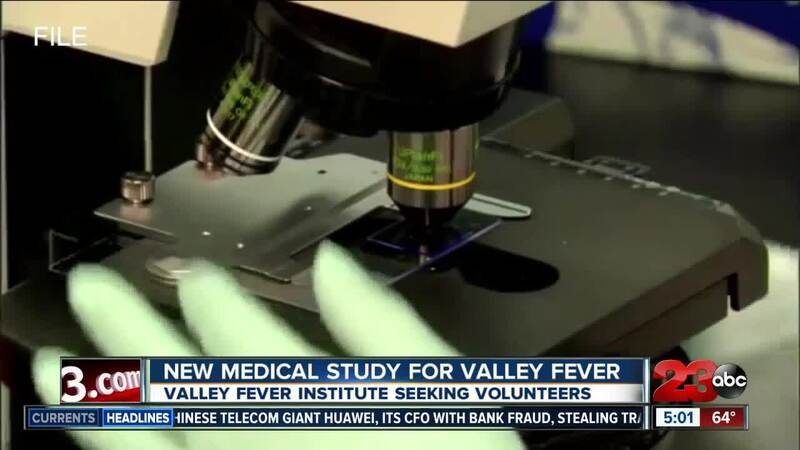 If a participant finishes the trial, they may receive compensation of up to $600..
All study care, visits, and blood draws are at no cost to participants, according to the Valley Fever Institute. For more information on the study you can call the Valley Fever Institute at 662-706-6748 or visit their website .